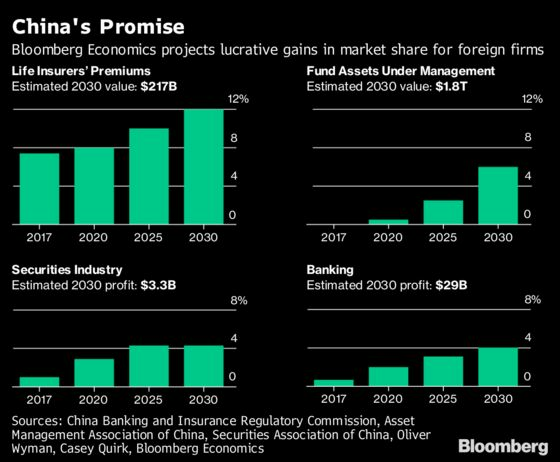 (Bloomberg) -- China pledged in late 2017 to allow overseas financial firms greater access to the world’s second-largest economy. Then came the trade war with the U.S., raising concerns that President Xi Jinping could retaliate by going back on his vow. Xi says the opening is steadily widening. The take-up by foreign companies is gathering pace but concerns linger. Premier Li Keqiang addressed financial opening at the World Economic Forum. China also looks to deepen its foreign-exchange markets. QuickTakes on the caveats of China’s opening and a U.K.-China plan to link stock markets. Bloomberg Economics: China’s financial sector in 2025.